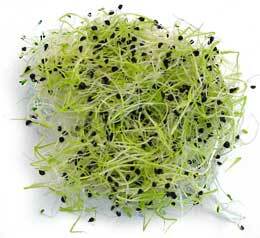 A black seed with a pale yellow to bright green sprout with and a definite onion aroma. 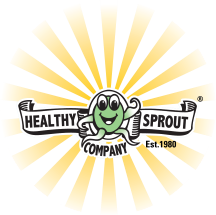 Like their bigger brothers the onion, these sprouts are a natural antibiotic and can help kill a long list of diseases. Onions can aid the reduction of blood sugar created by sugary foods and assist in keeping the blood in better shape to help fend off cardiovascular disease. A good source of vitamin A, B group vitamins, iodine, phosphorous and potassium. Delicious as a milder , but still flavourful, alternative to onion, in all those dishes that require a little ‘ bite ’. Very tasty in cheese sandwiches and popped onto a cheese toasty. Cook the spinach 1 minute in a covered saucepan and drain well. Refresh under cold water and press in a sive to remove excess water. 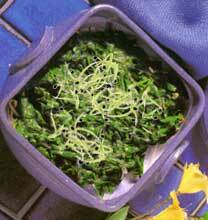 Combine the leaves with the sprouts and add the dressing. Toss lightly and serve in individual bowls.